You know what? Upon reflection, I think the greatest failing of yesterday’s otherwise eighties-licious 1989 Merkur XR4Ti wasn’t it’s automatic transmission. No, I think it was its total lack of cup holders. As someone who’s addicted to French Roast that’s an egregious omission. Few of you lodged similar complaints though. In fact, fully 60 percent of you felt that the car’s condition and $5,100 price overcame any such flaw, earning it a laudable Nice Price win. As we look at today’s 1995 Mercedes Benz E300D I think it’s important to remember the quote by Lao Tzu, which states: The flame that burns twice as bright burns half as long. Alternatively, we could consider the quote from the the Willard Motley novel, Knock on Any Door: Live fast, die young, and have a good lookin’ corpse. What do either of these have to do with this particular W124? Well, this model, with its OM606 DOHC diesel six, was offered here in the U.S. for just one brief model year making it one of the rarest editions of the venerable and beloved Mercedes mid-sizer. That OM606 is naturally aspirated and indirectly injected, but it does manage a solid 134 horsepower and, more importantly 155 lb-ft of torque. According to the seller the car needs nothing more than oil changes to keep it on the go. It’s already gone a lot, showing more than 256,000—yes, 256,000—miles on the odo. That’s a testament to how solid a base the W124 truly is. The ad also notes that the car comes loaded, carrying every option available with the exception of the motorized rear window screen. Major refreshment has been made to the suspension, front and rear, the steering wobbly bits, as well as the back half of the exhaust. Other updates include a replaced windshield, a transmission service, new engine mounts, fuel lines, and battery… The list goes on and on. Aesthetically, the car seems pretty tight. The seller notes some dings and dents and small pockets of surface rust in places. The most obvious of those issues is on the rear panel below the boot lid where a sizable indentation exists on the left, and a patch of pop-through appears on the right. Hey, at least its symmetrical! Otherwise, the paint hold a decent shine, the CLK wheels look handsome, and there’s that cool little set of slots in the right-front fender acknowledging the engine under the hood. The interior comes in black leather and lovely walnut trim. The seller has removed the airbag-equipped steering wheel, claiming its leather covering is too grody to use. It comes with the car, but in its place is a Nardi tiller that looks nice but won’t do much for your dental work in the event of a collision. An aftermarket stereo and updated speakers are also in the house, but, like the steering wheel, you get the original Becker in the deal as well. eagle eyed viewers will have noticed that the egr blend valve linkage is missing in the engine bay picture - the egr is currently blocked off (valve stuck to shut) via vacuum line block offs and removing the linkage. theres no check engine light and it runs great (much better mileage) this way, but it would take ~5 minutes to bring it back to stock. I’m going to go with, if it only takes 5 minutes, go ahead and take them and then get back to us. Alas, nobody listens to me. Other noteworthy issues are a somewhat sagging headliner, non-functional tilt mechanisms on both front seats, and failing clear coat in places around the car. Other than that, it seems damn fine. The question is, is it $7,000 fine? That’s the asking and it’s up to you to make that determination. The seller notes that it’s not the cheapest W124 on the market, but claims it to be one of the best. We’ll just see about that. 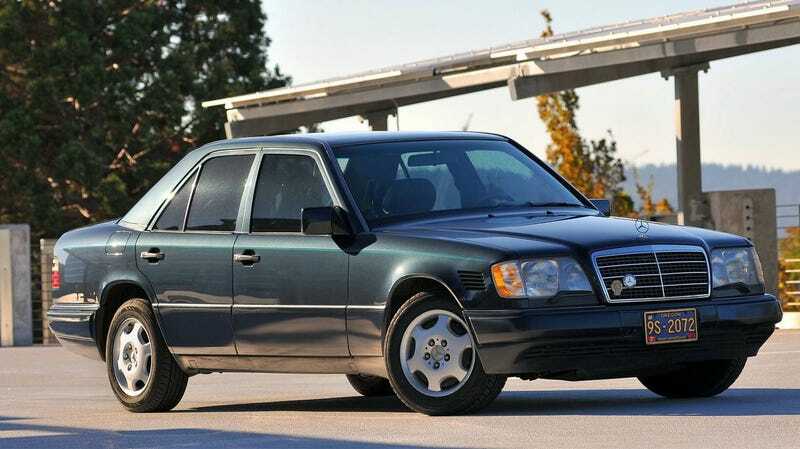 What’s your take, could this rare diesel E-class go for $7,000? Or, is this a Benz that has too many numbers in both its mileage and its price? At $5,100, Is This 1989 Merkur XR4Ti a Mercury Rising? For $8,000, Does AMG Make This MB OMG?